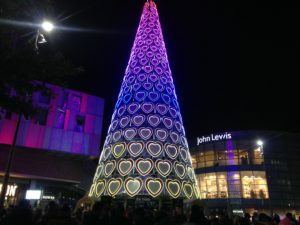 Scousers were urged to ‘Get Christmassy’ as the Liverpool One Christmas tree was illuminated to kick-off the festive season on Thursday night. Crowds of Liverpudlians took to the city centre to soak up the atmosphere and enjoy the entertainment that was scattered about the streets. 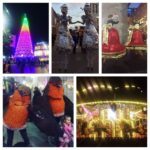 An early highlight was a large-scale ‘pantomime-style’ performance starring the Liverpool One elves, culminating in a flash mob which got shoppers dancing along in the Christmas spirit. Fairground rides were put up in Chavasse Park, accompanied by traditional food and drink stalls. 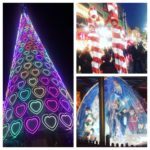 With hot chocolate and mulled wine all round, the masses of spectators gathered to watch the rainbow hearts come to life on Liverpool’s renowned Christmas tree. A surprise visit from Father Christmas stunned the youngsters in the audience as, during the switch-on, he appeared in a plume of smoke from the roof of the John Lewis building and waved to families who filled Paradise Street. On Upper South John Street, Claire Simmo and the Radio City crew kept the party going once the shopping streets were fully lit up. Famous faces came to town, including former Hollyoaks actress Jorgie Porter, promoting her upcoming role as Snow White in the pantomime at the Empire Theatre. The former ‘I’m A Celebrity’ star told the crowds that she was nervous about the part, with this being her debut panto performance, but said she couldn’t be happier to be back in the welcoming arms of Liverpool. Another welcome guest was Shrek, who had come over from the Dreamworks Lights event at St George’s Hall for a dance and to take selfies with his many fans. 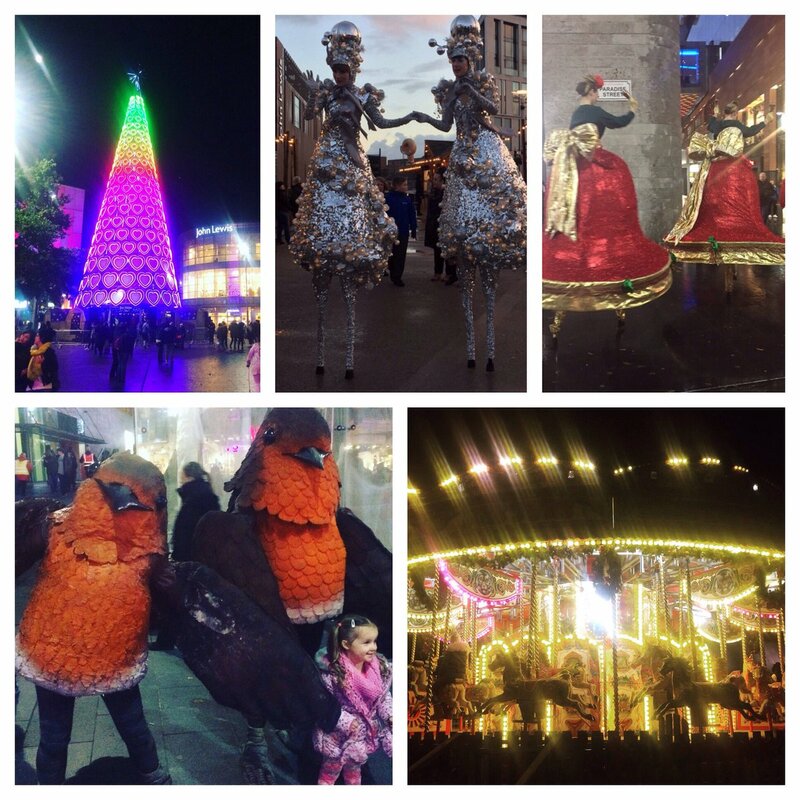 People were encouraged throughout the night to get involved with the events on Twitter by using the hashtag ‘Get Christmassy’. 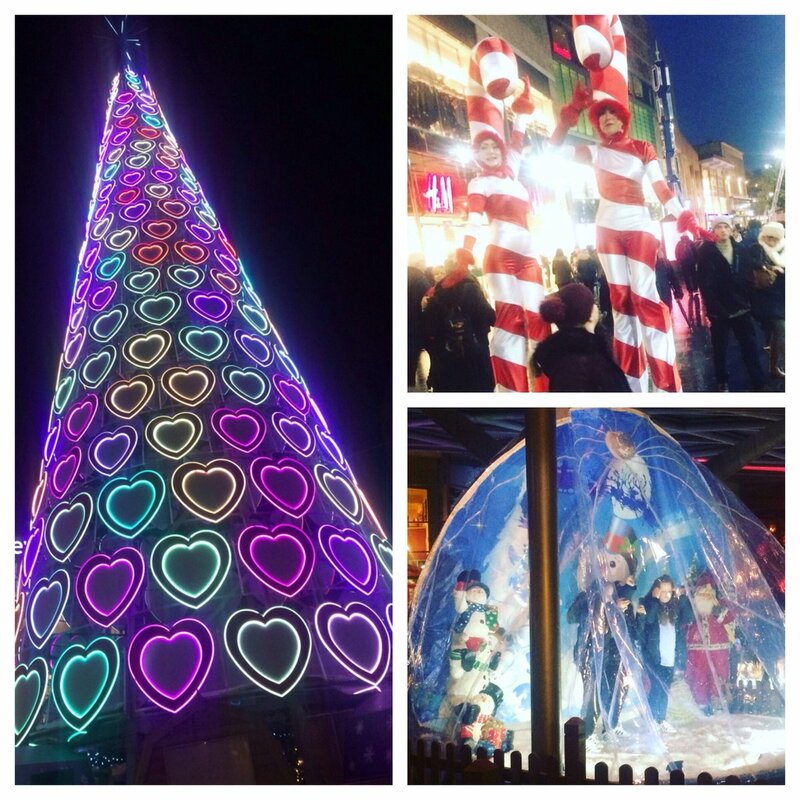 Visitors used the social network site to share their selfies with the elves – branded as ‘elfies’ – and general feelings of merriment as Christmas was officially launched in Liverpool.